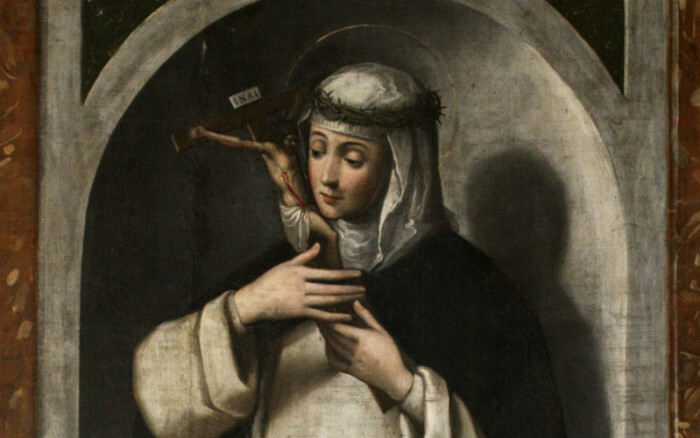 April 29th is the feast day of the great St. Catherine of Siena. Though it’s not clear whether they were identical or not, St. Catherine had a twin sister, Giovanna. They were born prematurely when her mother was forty years old. Unfortunately, Giovanna died in infancy. Her mother had another child two years later and named that child Giovanna as well. That’s right, she was one of 25 children. And yes, they were all from the same parents. Granted, only about half of them made it to adulthood (due to a high infant mortality rate), but still, that’s quite the family. An early biography written by her confessor claimed that when she was 5 or 6 year old, she was walking home and suddenly had a vision of Jesus enthroned in heaven surrounded by the Apostles Peter, Paul, and John. The two most culturally accepted paths for a woman in her time and place were marrying or becoming a cloistered nun. St. Catherine resisted both options. Apparently, St. Dominic himself appeared to her in a vision, which convinced her to be a Dominican tertiary, something that at the time was normally reserved for widows. She also got special permission to wear a habit. Initially, she lived her vocation as a Dominican tertiary in silent isolation in her family’s home. Then, when she was 21 years old, she experienced a vision of Jesus in which he wed her as his bride, and even gave her a ring. She was then told by Christ to leave her solitude and serve the poor, which she did. First reported to have been experienced by St. Francis of Assisi a little more than a hundred years earlier, St. Catherine received a version of the stigmata in 1375 that, according to the biography written by her confessor, was only visible to herself per her request of God. In her late 20s, she started dictating letters with scribes to various rulers and clergy, begging for peace between states and for the papacy to return to Rome from Avignon, France. She was so respected, she was sent on diplomatic peace missions by various governments. In early 1378, she was sent by Pope Gregory XI to Florence, Italy to seek peace between Florence and Rome. Soon after, however, Pope Gregory XI and violence broke out. On June 18th, in the midst of violence, someone tried to assassinate her, though she survived. St. Catherine of Siena, please pray for us!